The leader of a cult group who was arrested over the weekend by the operatives of the Rapid Response Squad (RRS) of Lagos State Police Command in has said that no amount of gun – shot can penetrate his body. The cult suspect, Andrew Awalebi, 35, who belonged to Eiye Confraternity, was arrested on Friday morning at a beer parlour in company of three other cult members around 8:00 a.m.
Two other members of the cult group, Adegoke Adeleke (30), Kehinde Adebogun (31), were also picked up early Saturday morning at an hotel in Ikorodu. Awalebi, from Ilaje Local Government, Ondo State was given out by Michael Thompson of the same Eiye Confraternity as a cult leader. Thompson was arrested a night before for robbery in National Stadium Surulere, Lagos. Awalebi, who disclosed that he worked with a popular land owner in Lekki stated that he earns N40, 000:00 monthly from the property dealer for helping to protect his landed property in the axis. He told investigator that the gun – shot protective charm was specially prepared for him by an herbalist in Ijebu – Isiwo, Ogun State to save him from gunshots of land grabbers in Lekki. “We are eight member cult group. We meet very early in the morning or late at night. I have been arrested by Special Anti – Robbery Squad sometimes ago when my cult group caused mayhem in Jakande Estate, inflicting injuries on passers-by in the area,”he disclosed. 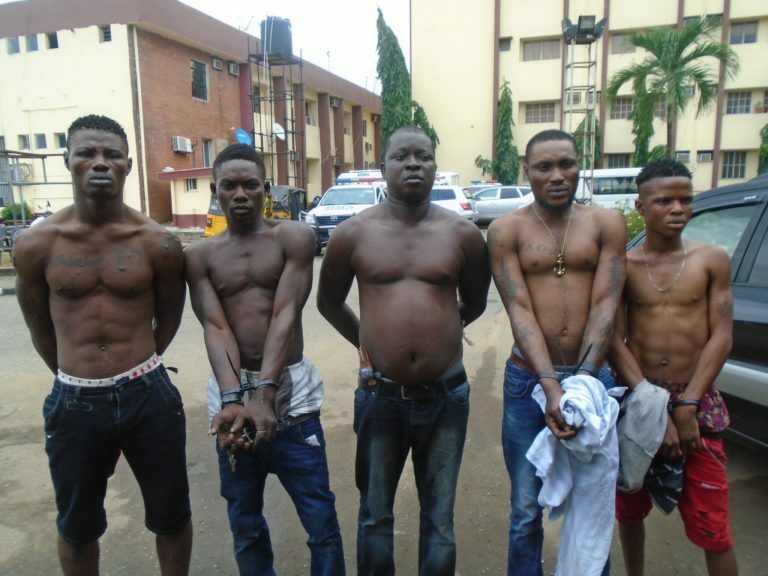 Arrested alongside Awalebi were Michael Thompson (24), Adegoke Adeleke (30), Kehinde Adebogun (31), Koffi Kwame (17), Daniel Olayiwola (36) and Tosin Issac (26) as they all confessed to be members of Eiye Confraternity. While confirming the arrest, the image maker of Lagos Police Command, Superintendent of Police, SP Dolapo Badmus, warned parents and guardians to be wary of their children and wards’ behaviors. “Charity begins at home. But this should end there. Parents should help police to tackle cultism in their respective localities. They should endeavor to report to the nearest police station around them if they suspect movements of their children, this will help the Police to nip the cultism to the bud,” she advised. The cult suspects have been transferred to the State Criminal Investigative Department (SCID), Panti for prosecution.